I`m using Locus Pro on bike tours for navigation. In this case it would be awesome to have an altitude profile as additional information for the prepared track. 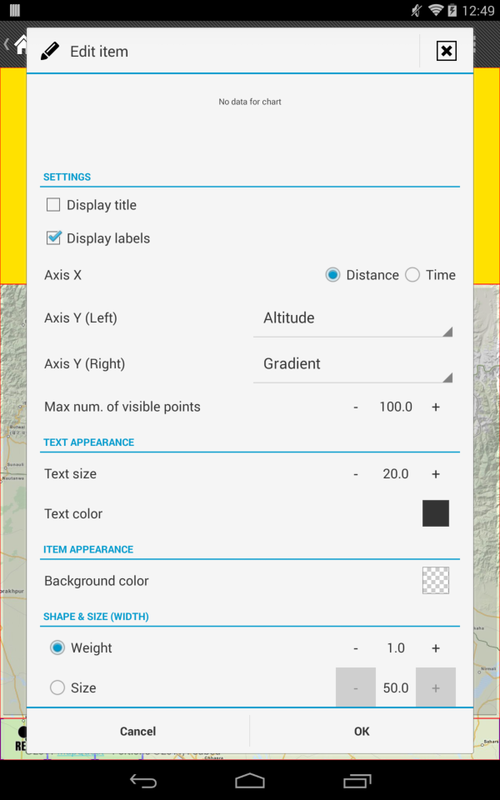 Since Locus Pro 2.0.2 (the newest version on Google Play Store aka Android Market) there is some SRTM support. You can add altitude data to tracks by "+ Fill altitude"/"+ Höhe eintragen" in the list of actions after tapping on a track. However this SRTM data needs to be downloaded if you use this for the first time on a certain combination of latitude/longitude which is triggered after you tap on "+ Fill altitude". Well, I missed that thread but that`s not quite the same what I`m looking for. I edit my tracks online at my PC with http://www.naviki.org and then I load them into locus. The altitudes are already included in the XML file. When riding on a bike I would like to see not only my location in the guide but also the next ascents and descents. A small additional diagram with a moving cursor would be the best solution. Nice! The principle is the same. Only the use case differs a little (air craft vs. bicycle). Where can I find this app? Oh, this would be very nice! So one can see the altitude on the way ahead. Perfect for bikers. Do it! No matter where you place the altitude profile, it is going to obscure part of the map. In aircraft navigation displays, the profile is placed at the bottom, with the logic that you are usually not as concerned with what is behind you, as you are with what is ahead of you. Yes, you should always save enough energy to open the door to the pub! Would the graph cursor be dynamic, and follow your position, or would you have to tap on the graph. Seems dynamic would be more technoerotic. rethought this issue: both ways should be possible: for planned routes a tap on track or chart should be indicated, for guiding a dynamic view. Yes, I used to also feel sorry for "poor menion". I even gave him last weekend off. But then tommi62 mentioned that menion is married to beautiful Hana. Now I do not feel quite so sorry for "poor menion". an enhanced altitude profile display would not only include my current position but also mark all visible waypoints. implementation should be straight forward, since locus obviously knows the coordinates for each point in a profile. it could search through the currently enabled waypoints and write them into the profile when they are "close". sorry - no news yet. Current fill altitude only adds altitude data at track points so get very sparse altitude data in chart view if planning and creating tracks rather importing from GPS. Would be good to have chart view and altitude data based on up sampling the number of track points if sparse/far apart either to a fixed minimum number of points or a fixes inter point distance. Alternatively add the ability to create a copy of a track with adjustable point up sampling and we can then use the existing chart on this track. Is it possible to view a chart of the real time altitude and speed information as we are recording a track? I do not mean viewing the information of a prerecorded track or navigation route. The "MyTracks" custom screen seems to have all the information,real time that is being recorded, as is shown in the Data>Tracks>Information page for a recorded track except for the Chart page. Either something as shown by Maddel on the Map screen or a separate page as on the GPS and Compass pages. hi, chart tab (in information page) display! current profile and all values. It`s refreshed every time, new point is recorded so it`s possible to view here real-time values. This isn`t working for you? Next bicycle season starts soon and I`m waiting so eagerly! this is something that I would like to create, I also see that quite a lot of people is interested in this, but it will also take quite a lot of time to create it fast and usable. I`m not sure whether it`s really part of the topic here, but I would appreciate a lot being able to enter the planned altitutde of a trackpoint manually for later guidance. I know, that it can be added automatically, but I use Locus for aviation and the ground level is usually not the one I need. BTW, I highly esteem your work! Sure a nice feature for bike tours. An alternative, but definitely as difficult to implement like a profile view, could be a colouring of the rack shown in locus itself. Lets say the track will be shown in red if that part is steep, orange for medium acclivity and green if its flat. came here to request this very feature - altitude (elevation) is extremely important when planning a bike trip and i`m still quite amazed it`s not conveniently available in Locus which is otherwise crammed with tons of features. it is somewhat absurd that i find myself switching to google maps ever so often because of this. Many people don`t know that, but you can enable the Measure tool in the Labs section of the settings, be sure to check it out. It draws a route and creates a nice profile with some simple stats. frankly though, even though the profile graph is great, i`d be trigger happy even if Locus allowed me to just display elevation at each point of my planned route. i have the turned on the feature that displays elevation of the map center after some idle time, but that`s very cumbersome. i`d also happily trade the azimuth markings for an elevation-change reading in the add route graphic! now, wouldn`t that be cool? see, my girlfriend always fusses about how much of a climb there will be ;). @LaCroix - this is also there. Did you tried function "Add new route & measure"? Try to add there for example three points and in bottom menu choose "tools > show chart"
@menion: yeah, i know it`s there, but it`s just too "far away" to really be convenient. i suggest you try the labs measure tool in android gmaps, you`ll see what i mean. 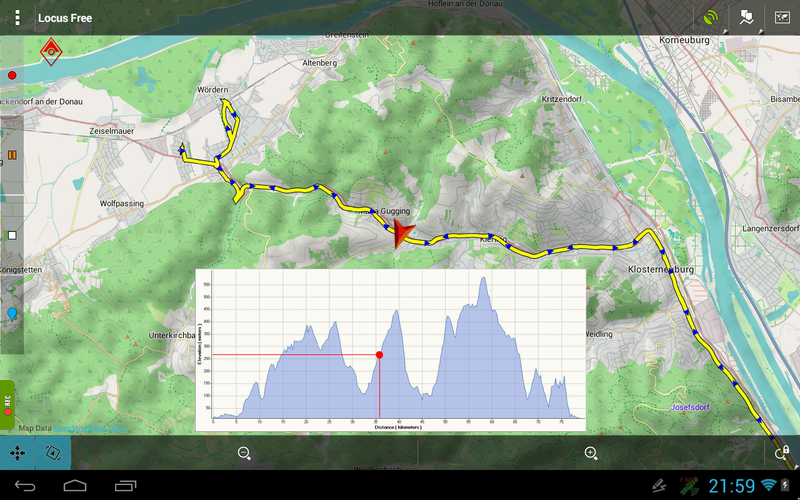 (and a humble subcheckbox "Also show elevation change instead of azimuth at route segments" ;). anyways, keep up the great work, appreciated! fwiw, here`s the measure tool in gmaps. it`s actually quite primitive compared to the possibilities that Locus could offer to go with it (like draggable points). 3. improved display of points recorded with track. Chart panel is currently hard-coded in this track screen. So even that content of track record panel is created in same way as dashboard, it's not yet possible to include chart also into dashboard. But worst part is done - create chart as a separate small window. Enjoy first taste, hope you like it. I don't need the other stuff because i have my own dashboard. You spend lot of time for new features. [CZ] Zdravím, boční panel nahrávání stopy vypadá efektně, ale člověk si tam snadno něco rozhodí. Šlo by dát do toho menu, které se zobrazí pod ikonkou [stranový klíč+šroubovák] (nebo někam jinam) checkbox "Zamknout nastavení"? S tím, že pokud by to bylo zamčené tak, by nešel měnit profil, nešlo by měnit, co se na daném místě zobrazuje apod. Prostě by fungovalo jen tlačítko pro start nahrávání a v režimu nahrávání pauze/stop/přidání bodu. Pokud bych kliknul jinde, tak by se jen zobrazil toast s informací, že je to zamčené. Nebo alespoň ty změny udělat na dlouhý stisk. Aneb pokročilé možnosti jsou fajn a na Locusu si jich velmi cením, ale měly by být vypínatelné, pokud nějakým způsobem ztěžují běžné používání bez nich. Do we REALLY need digits? Never mind ... see screenshot. I think this was missing. for normal usage. Anyway testing in the field will show. Its not a 2 men show, as I am sure there are quite a lot of people, who follow this with big interest, as I do. - zoom in and out the graph, x-axis and y-axis independently without going into settings but on the graph. - zoom in/out for charts in dashboard is not planned. I hope it will be serve only for a fast and quick overview. Not for some advanced handling. For this exists chart directly in track detail. - "not in graph, but in dashboard: altitude done and to go" - you mean some values about already passed elevation and elevation before you? It's task to dashboard, not to "Altitude profile"
It would be nice to select a point on the graph and we locate that point on the map / track. 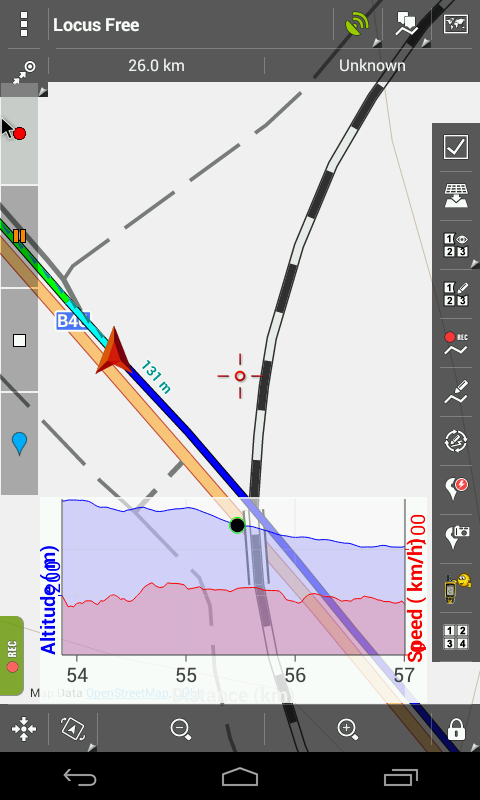 That functionality exists today in the graph on the screen track information, but selecting a point to locate it on the map, close the screen with the chart. Apparently the graph is coming up now just for information in real time and not so much for a subsequent analysis of the track. Otherwise, it would be good to move the chart to the right / left to change the zoom without going to such properties which discussed above. PS: maybe this idea is for a new display track information. tigus, I'm worried that you, as well as Tino, wants overpower this feature. My imagination and hope that also most of people here, was to create very easy to use version of visible chart directly over map without any crazy features aroung. As I wrote - for some analysis and work with charts exists big screen directly in track details. I believe there is no need for such features in dashboard! Hello Menion, it is understood that it may be overloading the current idea. But "physical / visual" space I think as shown above image Gynta, with graph on the bottom (or top) could slide a finger to the chart to the right or left to "forward / backward" in graph, and play on the chart to select a point which locate on the map. I see very useful for further analysis of the track. You are right, I meant already passed elevation and elevation before you. A feature I strongly wish for the dashboard. zoom feature is really helpful. Are you familiar with the Garmin Devices? There is a + and - symbol on the x and y axis to zoom. This is quite useful depending if you do a tour with 2000 hm or just 300 hm or wether you want a overview of the complete tour or just the next 5km. The feature Tigus mentioned sounds also useful to me. As I mainly use Locus for mountainbiking, information to altitude is quite important for me. I hope it doesn´t sound to demanding. I have great respect for your work already done and Locus is by far already the best biking-solution I know! how much points to go/done ? 50/50? means my pos dot is in center? and if I like to see 70/30? or 80/20? and btw. agree with "don't overload it"
so guys, understand what you wrote, but my last word on some major extending of functionality - in next version will be light version as is now. Tuned and working. If this will work fine, without any problems, we should discuss improvements (but don't expect a lot because I will try to keep this as final solution :) ). new version of Locus (version 3.0+) is out for one week, so enough time to at least quickly test this feature - ability to display charts directly on map. this long desired feature. First of all: Using Locus I did not miss my dedicated GPS device at all! on the map (eg shelter, water, pub ;)) is reached. to set the range of kilometers that is shown forward and backwards. backwards and forward same as it is there for distance? glimpse on what is coming, this might be a real help. I absolutely agree with Tirfo! The most missed function is altitude forward or "altitude to go". The possibility to show the next 40km or next 20km in the profile is the zoomfunction I miss. Apart from this, I think it´s perfect. 1. to simply follow a track is not so easy - there is still need to say "hey this track should display this chart". Because there is no limit in amount of tracks on map at once. And this is quite complicated now - at least I don't see any simple solution. 3. I've added this values also into popup of points. But more and more I feel, that these popup labels are really bad looking and more and more need rewrite to some new better design. I'll leave it for now, but expect that they will change in near future. Hope this is better then nothing for now ;). Because in latest 3.1.0+ is also dramatically increased speed of offline altitude compute, I believe that these charts will be more useful then before. thanks a ton for implementing these changes, it is pretty close to perfect now! The only thing that I don't understand is, why is there a limit of 10000 m for the max visible range in the dashboard altitude profile? Don't you think it makes sense to have, for instance a whole day trip (50-100 km) on the profile? Of course, the profile should then be set big enough... or the symbol that indicates the current position should be more fine. it is pretty close to perfect now! The only thing that I don't understand is, why is there a limit of 10000 m for the max visible range in the dashboard altitude profile? Don't you think it makes sense to have, for instance a whole day trip (50-100 km) on the profile? Of course, the profile should then be set big enough... or the symbol that indicates the current position should be more fine. How do I actually choose the track to show in chart? I tried guide but it always say "no data for chart"
Ok, I got it. I chose the wrong chart. Took the one for track rec instead of navigation. Didn't realize there were different ones for each purpose. it's possible, that track for which you wanted to display chart, had no altitude values. 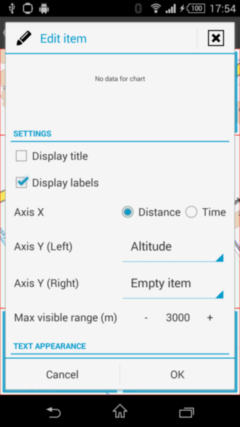 You may use function "Fill altitude" in track bottom menu, to fill manually altitude values to all points. Then chart should work as expected. I have an idea that can practically be implemented. The route is currently drawn in only ONE color, but how about use TWO colors? if "next point altitude" is higher than "current point altitude" (uphill) than draw the route RED. if not (downhill or flatland), draw the route BLUE. I think that the user get easily feel of the altitude profile by using two different colors in uphill and downhill. I hope it could be implemented and Thank you VERY much for your app. Please try tap on your track (that has altitude values), tap on "line" below map overview, to edit track style. In "Line style" dialog, uncheck "Use forlder style" and from "Mode" selection, choose what you need.